I have to admit, your thoughts on this one might be totally messing up my plans for this year (in a good way). I have been planning to buy a knife for myself around the holidays (haven’t bought one for a little over a year), and the three on my list are the Kizer Gemini, the T.R.E., and this one. At more than $100 less than those other knives and with a high recommendation from you, it’s going to be hard for me to justify the Kizer or the Lionsteel. I usually avoid “cheaper” framelocks for fear of quick wear (since I doubt the lock face is carbidized on a knife at this price). But your review is even alleviating that worry for me. I’m also interested in the finish of yours. I thought the blade on the ti-handled version was a polish/mirror finish, but yours looks satin. I’m not sure I really have a preference, but I didn’t know the ti/satin version existed. Or maybe they’re the same knife and I just had the wrong image in my head. The Gemini and TRE both look interesting and will likely stand up to more abuse than this ultralight trapper. However, I think for $60 it’s a very compelling piece. For what it’s worth, I wouldn’t mind a TRE or Gemini, but the Trapper is the one I bought first. My blade is a satin finish and is definitely not polished. The countersinking is all polished. Own the urban trapper, the more modern version with the black handle. Love it, and just put in a new sink, replaced the fixtures and garbage disposal, too. Had my swiss army in addition to my tools. Swiss army made numerous appearances during the project, as was to be expected, but I was surprised how often that nice slim long blade came in handy. Very tough, though it doesn’t look it. Just a more flexible knife, I think, so it seems less durable. But you’d be surprised how useful it is to have a blade that is durable and a little flexible when you’re in the middle of a project. I was. Definitely worthy of an EDC, don’t knock it! Your high praise makes me want to try one although I avoid most sub-$100 knives. I’ll probably try the CF model which is a liner lock as opposed to the titanium frame lock model you reviewed. I like the symmetry of CF on both sides. They weigh about the same. I enjoy knives at all price points (and still get a kick out of a well made $30 knife, like the Zancudo). So feel free to take the recommendation with a pinch of salt. That said, this is a real nice knife, and compared with every other knife $60 can buy I think the UT punches well above its price tag. I could see this being a $100 piece. I understand. Not that I totally avoid the sub-$100 market but I seem to find most of what I like in the $150-$250 price range. 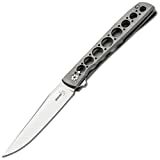 I ordered a Boker Plus Urban Trapper Knife Carbon Fiber for about $83. I hear ya. You hit a certain of level of quality in that range and it can be tough to go back to the cheaper stuff. Congrats on the UT. I will be curious to get your take on it when it lands (especially the CF version – that is tempting). Oh man, I was planning on getting a Buck Marksman based on your recommendation but now I see this one. Given they are more or less in the same price and size range do you have an immediate preference between the two? I really like this Urban Trapper – it’s a much smaller and lighter knife though. Apples to oranges really. If you are looking for more of a light duty EDC the UT would be my choice. If you are in the market for a full size work knife then I still love my Marksman. Hopes this helps. I love mine, but I wish it was a quarter inch shorter in blade and handle. It is a bit long- like a steak knife. Reminds me of a high class Kershaw Chill, but better in every way (except price). I agree with your review on all points – I’m amazed this is a Boker Plus knife. I own about 6 of them and the Anso Albatross is the only one that did not have fit and finish issues, until this one. The one issue I do have is that the detent is weak. I can open it with just a hard down and up wrist flick. I do fear it could open in my pocket and as it is tip up, I could cut my thumb getting it out. This hasn’t happened, but it makes me a little nervous. I’ve tightened the pivot and it hasn’t fixed the issue- if you can open it with the flipper tab you can open it with just hand motions. You raise some good points. 3.5″ is quite large for an EDC (even a slim one like this). They should consider offering a smaller version. I just tested my detent and I can’t shake the knife out for the life of me. Sounds like you got one with a weak detent – you may want to see if Boker will warranty it. Thanks for the reply. I’ll probably live with the weak detention. Not worth a lot of extra legwork for the $60 I paid for the knife. I still like the knife a lot. It’s actually an improvement over my pay exclusive won’t Boker Plus. Excellent knife. The carbon fiber version is my everyday carry. Thank you, Cody. The CF version looks sweet. There is a marked stylistic similarity between this knife and Boker’s Kwaiken flipper. You gave positive reviews to both, but seem much more impressed with the Urban Trapper (perhaps because of the quality/price combination). Between the two, do you have much preference? What really impresses me the most about the Urban Trapper (vs. the Kwaiken is it’s weight and pocketability). The Kwaiken is a nice knife and is very stout (stronger than the UT), but it is very heavy and you really feel it in the pocket. The Urban Trapper is much lighter, slimmer and more elegant. It is far superior for my kind of light duty EDC. However, both are nice knives in their own right and if you favor a stouter option I’d suggest the Kwaiken. Hope this helps. They definitely revised these from the first release, which my friend picked up while in Germany. They increased the size of the flipper and changed the blade finish to satin (from a polish). Maybe made the pocket clip smaller too? Whatever they did, it looks like it worked. Definitely picking one up. Interesting, Dave. It’s cool to hear how some of these early / per-production designs get tweaked in to full production models. Seems like it. Take a look at BladeHQ’s youtube overviews on the Ti Version (date stamp @23Apr2014) and the Liner Versions (@15June2015). The latest video showed the newer Ti version (#2088 stamped on the frame vs. #0477 on the older video) and the flipper tab seems to be longer though the blade is still polished instead of satin. I hope Boker or a seller can confirm that they have indeed made the changes (longer flipper, satin blade) as that is more appealing to me. Just received this for Christmas from a colleague. Not a huge collector, but I have a few folders now and seem to be catching the collecting bug (Kershaw Composite Leek; Kershaw Cryo Hinderer, Benchmade Mini-Grip. ; Spyderco Endura). I’ve only had it for 2 weeks, but I’ve used it as my exclusive EDC since and really enjoyed it. The steel is great, with the finish being the slightly polished one (not mirror) described in the review. The detail taken with this relatively inexpensive knife is honestly quite impressive, from the polished cutaways to the inset clip, and the perfectly centered blade when closed (both my Kershaws, which I love, are significantly off-center from the frame lock when closed). And of course the weight of this knife is STAGGERINGLY light! It’s really difficult to explain the feeling you have when you flick it open for the first time, and realize something THIS LIGHT can do so much. At first I was a little disappointed at the lack of jimping on this knife (none except on the flipper tab). However, after using it, I’m pleasantly surprised at how steady it is on task. The flipper of course doubles as a light guard, but the seemingly decorative cutaways in the blade provide more than enough grip for what you will use this knife for. I’m now glad they didn’t add jimping to the spine, because it’s such a pretty knife. The edge has stayed as razor-sharp as the day I first opened it. The clip works great on just about every pocket (jeans, suit pants, jacket pocket). This isn’t a knife I would take camping, but after using it every day for a couple of weeks, it’s hard to go back to my other knives for EDC. The only criticism I have is a very minor amount of play present in the blade when locked open; it’s VERY minor (not really noticeable during use, but rather when under close examination). I tried tightening the pivot, no dice. It’s a small thing, that in all honesty I may never have noticed (but given my nature, now that I have it irks me :-). If you need something sharp, reliable, and unobtrusive, I would be extremely hard pressed to find a better knife I think. TL;DR- I really love this knife, and would give it as a gift to either an inexperienced carrier or collector alike. Thanks for the great comment and insights into the Urban Trapper. You point out a number of reasons why I like this knife. Sorry to hear yours has a little blade play. I suppose if I really reef on mine I can eek out a little play myself. Hey Dan, I don’t see this knife listed on your recommended EDC page, does that mean you have changed our mind on this knife? Please let me know I was thinking of getting one! I have just been lazy / busy and haven’t updated the page yet. I need to do that. It’s still as awesome of a knife today as it was when I originally reviewed it. Thanks for stopping by. I did have an issue with mine that the lockup was way less than 20% – probably 10% or less… No big problem though. A little work with a needle file and now it’s at least 50. One question: What’s the number on the frame? A serial # or lot #? The reason I ask is because I noticed that the one in your pictures is 36XX while mine is 0082. Thank you for the thoughts on the UT. It is interesting to hear how early your lockup was. In regards to the number on the blade, I am guessing that is a production # of some sort. Maybe you got an extremely early version of the knife? I am just speculating. Do you know if there is a slightly smaller version of this knife? I love the lines and appearance of the knife but a smaller knife that retains these qualities would be amazing. Hey Thomas, My understanding is that they currently do not make a smaller version of this knife. If it becomes as popular as the Kwaiken then we may see them release a smaller version. I agree, that would be cool. I wouldn’t bother with this knife, at least based on my experiences with them. Ordered 2, one came beat to hell out of the box. Cocobolo handle came with a large portion of the finish rubbed off and a series of deep scratches on the other scale – Boker tried to charge me $15 for ‘shipping and handling’ for a 2oz knife (on top of what it would cost me to send to them), and then the customer service rep went on a tirade when I said that I didn’t appreciate having to pay extra for poor quality control. The other is incredibly stiff, and a small burr at the base of the blade keeps the frame-lock from operating properly. I could fix it by disassembling it and hitting it with a file, but this lack of QC on a $60-70 knife is really disheartening. Boker has definitely lost a customer. I am sorry to hear you had a poor experience with your Urban Trappers. Mine came in good shape (and I simply ordered it off Amazon), so it sounds like you got real unlucky here. Regardless, I appreciate you taking some time out to leave your opinion and share your experiences with the knife. Great review, i have just ordered my Urban Trapper (cocobolo version). I am unsure as to weather the IKBS system has loose bearings? or like the original trapper, caged bearings?